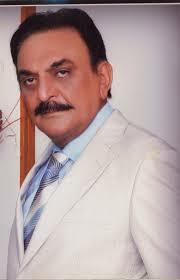 Abid Ali (March 17, 1952) is a Pakistani television actor who has acted in numerous television productions. He launched himself as a director with Saheli in 2007, which he also starred in. Currently he is starring in and directing Massi aur Malka a family based-drama on Geo TV since 2009. Ayesha Khan, Kashif Mehmood and Mehwish Hayat play lead roles. While at school, Ali was inclined towards writing and painting and never considered acting, but knew that he wanted to do something creative. Between 1968 and 1969, while at college in Quetta, he was spotted by Ata Shad from Radio Pakistan who told him that he had a good voice. He went for an audition, which he passed and started to work on radio while continuing to study at college. In 1973, he moved to Lahore and decided to chance his luck at PTV, and after taking part in many auditions, he began to receive work on television. He was married to Humaira Ali but the couple are now separated. The couple had three daughters together: Iman Ali, Maryam Ali and Raimah Ali. Iman Ali, who is an actress and model, has revealed that she has a distant relationship with her father. He married Rabia Noureen in 2006.